Style moderne with horizontal shading string courses, curved bay windows and strip windows. Deco-ish geometric modelling of façade. Most balconies now enclosed. Face brick base with garages is awkward. A well maintained six-storey apartment block with notable flagpole & crest motifs. Semi circular pavilion form on southwest and horizontal sunshades. Good entrance. Redecorated in interesting colours. 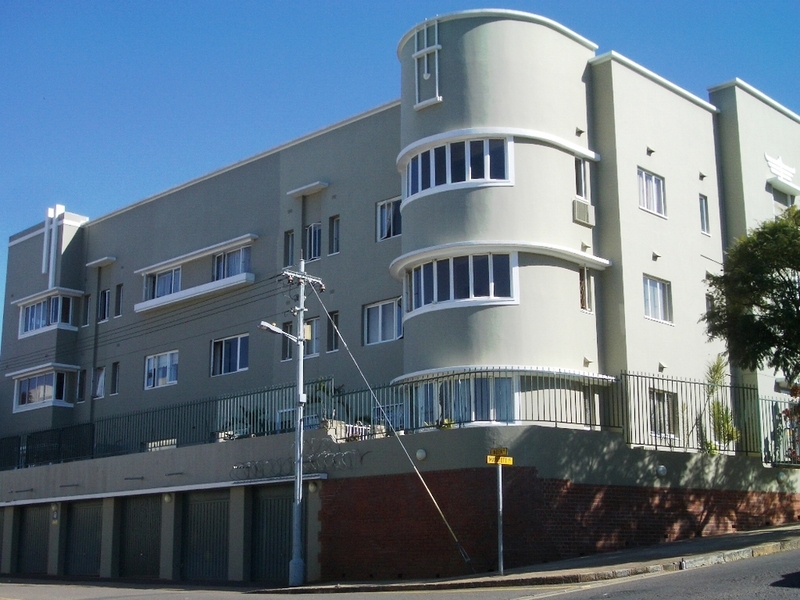 One of the great Art Deco buildings. Eight-storey apartment building with detailing of imagination and sensitivity. Block-like ground and first floors, rounded corners up to a squared off top floor. Fluted giant order pilasters rising up the entire height. Richly varied stucco reliefs with flying lions high up. Excellent resolution of geometry in the use of rectangular and curved forms. Well maintained and authentic colour scheme. Elaborate vertical & horizontal intersections at entrance. “Eye-lid” sun shields. Integrated face brick at ground level and plaster above. Hispanic deco. Now considerably extended, the original cylindrical corner entrance to Lowry’s Pharmacy has interesting ceramic tile and geometric glazing bar patterns. Good window detailing. Cantilevered balconies. 41 apartments built for Langton. Stucco finish with good mouldings in authentic Art Deco style. Fluted pilasters rise through the façade to a crenellated parapet with lion features. Central balcony at high level is richly decorated with sunburst pattern and the entrance below has an African feel to the surround mouldings. Well-designed rear elevation with cantilevered walkway and an amusing range of stained glass windows to the lift shaft, and flat entrances. Central vertical feature with well-detailed “sunburst” motif. Drawing by M.Vengan 9 March 1940. For Messrs Newfaze Properties (Pty) Ltd. Stylistically similar to No5, but the applied stucco relief, both horizontal and vertical is more elaborate. Vertical accent over the entrance goes the full height. Drawing by M Vengan (?) February 1940. For Messrs Newfaze Properties (Pty} Ltd. Similar massing to No’s 5 & 7. Stepped facade, central hall with vertical pilasters flanked by residential units with horizontal windows. Excellent ‘sunburst’ and ‘roundel’ decorative motifs at attic level. Streamline style. Very bold design, sweeping around the corner. Embraces sidewalk and balcony has not been enclosed. Unsupported corner creates space at the entrance. BEREA VIEW, 43 Carlisle Street. Islamic geometric patterning, notable small vertical feature collonettes. Alterations, proposed conversion to shops, P. Joseph, 1996. VEL-VET MANSIONS, 51 Carlisle Street..
Miami-style apartment block with good AD motifs. Windows changed inconsistently. CARLISLE CASTLE, 53 Carlisle Street. W J Cornelius, September 1940. Together they make a coherent group of four low rise Miami style apartment buildings with excellent geometric patterning in stucco on the façades. Backs of buildings are similarly detailed. Curved veranda over the pavement with elaborate geometric patterning. Nice contrast between the sweep of the veranda and the rectangular roof parapet above. Needs renovation. Bobby Naidoo's Travel. Sunburst pattern gable; stepped beam over balcony; horizontal shading slab. Small building with numerous art deco elements: round windows, horizontal shading slab, balcony over the sidewalk, decorated capitals. Two-storey mixed development with balcony over sidewalk. Very sophisticated use of horizontal motifs. Exceptional starburst pattern over the entrance. J E Jessel Drawing Office. January 1942. Indo-african style with a few art deco features.Symphony of arches, ballustrades and Dutch gables. Embraces sidewalk on two levels. Decorated ballustrades and stepped arch beams. Covers sidewalk at two levels. Prominent vertical columns. Streamlined finials. Modestly decorated spandrels. Good classic deco details. First floor balcony, supported on fluted columns, sweeps around the street corner, shading the side walk below. Unsupported corner opens entrance. Highly original and eclectic detailing to balustrade and pediments. Open veranda over sidewalk well preserved. Re-decorated 2002. A G Frolich, November 1933. For P E P Rorvick. Strong horizontal emphasis. Verging on “Style Moderne”. Zigzag parapet. Additional floor added by Frolich & Kass, 1947. Strong verticals. Good, imaginative decorative panels. Similar to a building in Miami. S.Patraka, 1936. Salisbury House, P O Box 1111. Flats for C L Moon. Alterations by Hirst & Simpson, 1962. Good skyline. Horizontal emphasis maintained by the new aluminium windows. Authentic and original Entrance Hall with fine light fittings and benches. Contrast between horizontal and vertical expression leading to the climax of the flying birds. Steel windows, originally with curved glass corners, fixed flush with the stucco façade. Strong geometric resolution of rear elevation & escape stairs. Fine entrance canopy with stone facing panels and stained glass features. Original curved glass corner windows have been replaced. Strong contrasts in vertical and horizontal elements; rectangular and curvilinear forms. Vertical pilasters rising through accentuated first floor. Rich in geometric, animal and marine fantastical decorative features. Glazed tile panel above the entrance commemorates the Union Castle mail ships that called at Durban for so many years. Formerly a residence for Merchant Navy cadets, now the corporate Headquarters of a shipping line and associated companies. Richly decorated in "Spanish, sub-tropical Deco." Good glazed shell motif. Well maintained. Multi storey mixed use building with curved flanks and central bay framed by strong verticals to a final moulded pattern on the upper segment. Superb inlaid hardwood elevator doors. Multi storey residential building with ground floor shops. Chunky geometry and an asymmetrical façade to Stanger Street. Curved corner bay windows and vertical emphasis over the entrance. Chunky geometry. Geometrically modulated facade. Vertical elements. Formerly the Metropole Hotel, now apartments. Brightly painted Miami style building with vertical & horizontal framing elements. Gently modulated facade with planes linked by horizontal courses. Former hotel. Ground floor has been lost. Style moderne. Substantially altered - unclear whether there was a matching North wing. Entrance element with curved corners, projecting balconies and capping. Curved corner contained between vertical columns. Notable deco-style ballroom at top. Multi storey apartment building with Aztec style decoration and emphasis on the corner treatment.